WE AIM TO PROCESS ALL RETURNS AS QUICKLY AS POSSIBLE, HOWEVER PLEASE ALLOW BETWEEN 3 TO 5 WORKING DAYS FOR ANY RETURN TO BE ACTIONED ONCE RECEIVED. IF YOU ARE REQUIRING A REPLACEMENT SIZE OR ALTERNATIVE PRODUCT URGENTLY, WE RECOMMEND RETURNING YOUR ORIGINAL ITEM TO US FOR A REFUND AND RE-ORDERING THE NEW ITEM SEPERATELY. For greater convenience and to enhance your shopping experience with Worcester Warriors Store, we now offer several easy ways of returning your items using Collect+, Royal Mail and other courier services. 1. Complete the Customer Returns Form that was attached to the dispatch email for you order or download our Customer Returns Form Then, repackage the item(s) securely and enclose the returns form. 2. Collect + to create a label using your order number and email address. 3. Pay the £4.49 return price which is a flat rate for any sized item being returned. Print off the label and attach to your parcel. 4. 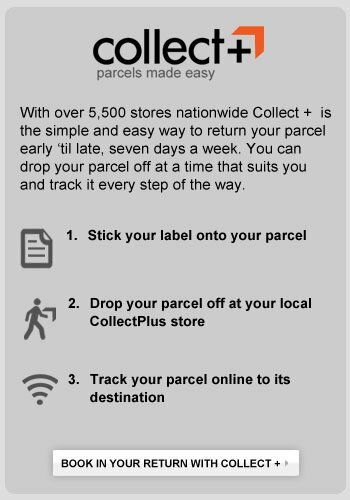 Drop off your parcel at your nearest CollectPlus shop. View your nearest one and take advantage of convenient opening hours and less queuing time. 5. You will receive proof of postage so that you can track the return of your order from the convenience of your home or work. 4. Please note, Worcester Warriors Store cannot accept responsibility for any goods lost in transit. We recommend using a recorded service for greater security. When returning an item, we are unable to reimburse the return postage cost. Worcester Warriors Store offers a FREE exchange service (UK Only). To exchange your goods for a different size, colour or item simply fill in the Returns Form below and send the goods back to us. We will then re-send the replacement item(s) back to you on standard delivery service at no extra cost. If speed is of the essence, select our Express Delivery option priced at £7.99 (UK Only).